I was introduced to this version of the Justice League with issue #69 as part of the Death of Superman story line. I was surprised that the vaunted and fabled Justice League featured such... I dunno, second stringers, I suppose. That wasn't the Green Lantern I know... Fire and Ice? Blue and Gold? It seemed so bizarre that these, to my young Marvelite mind, nobodies made up the elite DC Comics superhero team. Gritting my baby teeth, and pushing through the indifference (I just wanted to get to the Superman and Doomsday stuff, you see), I actually found myself really digging this team. So much so, that I picked up the next few issues... only to be terribly disappointed when they shook up the roster in issue #71. My picks of the team were the Blue and the Gold. Yeah, I know... totally novel opinion there, right? I would try and pick up older issues of the JLI that featured them whenever I could. 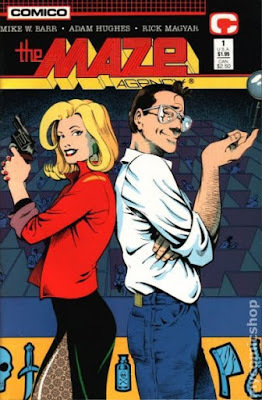 This was the early-nineties, and due to the somewhat increased interest the Death of Superman story line brought the title (along with the steady supply of speculators in the market) such a venture was not cost efficient to my lunch-money fueled budget. I revisited this endeavor some ten years later, and have since completed my collection. This run is something of a "comfort food" to me. This, along with the Peter David Incredible Hulk are runs that I read through, probably once a year... much to my ever-growing back-log's dismay. This era of Justice League is one that I hold a fondness for, and I never seem to tire of (until around the General Glory arc). Needless to say, the current Justice League 3001 is one of my favorite contemporary DC Comics offerings. The Blue and Gold Entertainment Group, fully sanctioned (unknowingly) by Maxwell Lord has opened the Club JLI. On the Pacific isle of Kooey Kooey Kooey, Booster Gold and Blue Beetle have opened a casino and Justice League-themed resort. 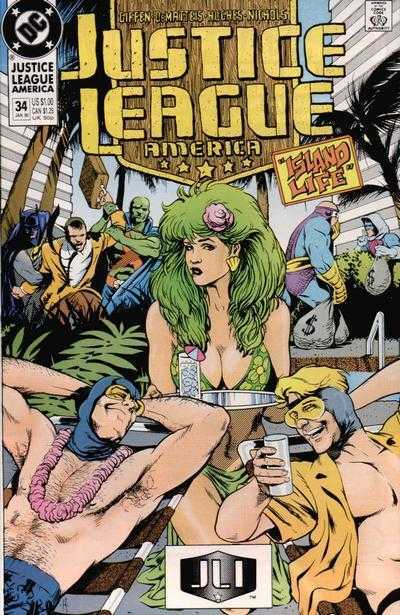 Using the talents of current JLI contractor/consultant Kilowog, who built the entire resort in three days, and the entirety of the JLI bank coffers, Booster and Beetle believe they are well on their way to insane riches. Justice League foes (and Justice League Antarctica members) Major Disaster and Big Sir, now destitute are trying to find ways to make some money (Major Disaster's current finances include a piggy bank containing $7.56). Disaster observes Big Sir counting cards and shortly after notices the the Club JLI offers the opportunity to gamble legally. Maxwell Lord discusses Booster and Beetle's latest antics with Batman and Martian Manhunter, and when Batman raises the question of how a couple of broke bums were able to pay for such an endeavor, soon discovers that all of his JLI bank accounts have been completely emptied. Major Disaster and Big Sir make their way to Club JLI through the club's teleport tubes, and are guided to the casino. They proceed to absolutely break the bank, to the point where the club needed to empty the slots and soda machines just to pay them off. As if that isn't enough, Aquaman arrives to inform Booster and Beetle that Kooey Kooey Kooey isn't just an island... it is sentient. Due to the the disturbance caused by the resort construction, she (yeah, she) has dislodged from the ocean floor and begun to move. This causes an earthquake which results in both the resort falling apart, and Major Disaster losing all of their newly gained winnings. I must sound like a broken record by now... but, this was a fun issue. This era of Justice League is somewhat akin to a superhero soap opera/sitcom, and is for lack of a better term, a very comfortable read. This is not to say that Giffen and DeMatteis kept their entire run soft and fluffy, they did know when to wrangle in the bwa-ha-ha and bring the action. Stories such as Kooey Kooey Kooey are in such stark contrast with, say, the Return of Despero story line, that they afford the reader the opportunity to see this team dealing with all sorts of circumstances. I've seen reviews of this story line being a low point of the Giffen-DeMatteis run, though I disagree. Maybe it's silly, arguably too silly... but it's just so hard for me to think poorly of it. For me, this run did end on a bit of a low point, with the General Glory and Breakdown arcs, however, Kooey Kooey Kooey is still among my favorite Justice League side-stories. This issue gets a recommendation, and is now available in collected edition. Justice League International, Volume 6 features the Kooey Kooey Kooey arc in full, along with a bit of what preceded it. I'd recommend the whole story, so the trade may be the best option for this one. Not too many 'Interesting Ads' this time, however, there was this gem! Three bucks? A bargain at thrice the price! There are too many great quotes in this issue, and I fear that they should be read in context for full appreciation.